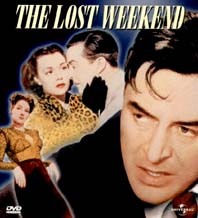 We follow an alcoholic writer (Ray Milland) on the horrors of a five day drinking spree in New York before he pulls himself out of hell. Billy Wilder (who also won the Oscar for direction). With Philip Terry, Howard DaSilva, Doris Dowling, Frank Faylen, and Mary Young. American Producer/Writer, Charles Brackett (1892 - 1969), who has worked with Billy Wilder. In 1950 he won the Screenplay Oscar for SUNSET BOULEVARD. Brackett's other works include: NINOTCHKA, FIVE GRAVES TO CAIRO, THE UNINVITED, A FOREIGN AFFAIR, THE KING AND I, and JOURNEY TO THE CENTRE OF THE EARTH. Charles Brackett and Billy Wilder received the Screenplay Oscar. Based on the best-selling novel by Charles Jackson. The first choice for the lead role was Broadway actor Jose Ferrer --- who was unavailable. The scene with delirium tremens is considered strong, powerful, and memorable.